Platelet Rich Plasma Therapy (PRP Therapy) is a non-surgical hair restoration procedure that has been shown to be effective in restoring quantity and volume of thinning hair. Male pattern baldness can successfully be treated with this therapy, but it is also suitable for both men and women who are experiencing thinning hair. Here are some of the details about this exciting therapy. In the human body, platelets are necessary for wound healing. Along with red blood cells, white blood cells, and plasma, platelets are components of blood. When a vial of a person’s blood is drawn and spun in a centrifuge to remove the red and white cells, what’s left is concentrated platelet-rich plasma. This solution can be used to accelerate wound healing in many applications; uses abound in dentistry, orthopedic surgery, and skin rejuvenation, among other fields. It can also be used to stimulate hair growth and increase the fullness of hair. The hormones and growth factors found in platelet-rich plasma, including transforming growth factor (TGF) and epidermal growth factor (EGF), have been shown to stimulate hair growth. In fact, the Cleveland Clinic sites a study from 2014 in India where men with male-pattern baldness experienced 30 percent more growth in thinning areas after undergoing PRP Therapy sessions. The platelets and plasma are derived directly from a patient, typically taken from the arm, are activated, and are then injected under the scalp wherever hair growth is desired. Rejection is not an issue since the patient’s own blood is used to derive the products. The procedure is considered very safe, with no drug interactions to worry about. And, aside from a mild feeling of pressure at the injection site, there are no side effects associated with PRP Therapy. Within a few months, the treated hair follicles show signs of repair in the form of visible new hair growth. Good candidates for PRP Therapy are individuals with thinning hair, including hair loss at the top of the scalp as well as a receding hairline. It is also a beneficial therapy option for people with androgenetic alopecia. In some cases of hair loss, it may be helpful to combine PRP therapy with hair transplantation. DiStefano Hair Restoration Center can answer your questions about hair restoration procedures. We’ve been at the forefront of the hair transplantation industry for over 20 years, with more than 10,000 hair transplant procedures successfully completed. 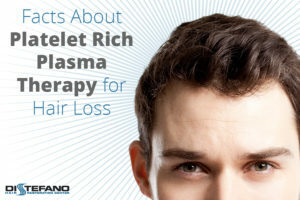 We also offer laser therapy hair maintenance in addition to PRP therapy. Give us a call at 508-756-4247 to discuss your hair restoration options and schedule a free, private consultation.